A passive infrared night vision system optional on the M5 helps the driver to more easily detect people, animals or other objects in front of the vehicle at night. Using an infrared camera to detect heat, the system then displays the image on a monitor in the dashboard. The C63 Sedan doesn’t offer a night vision system. The M5 offers an optional Side and Top View Cameras to allow the driver to see objects all around the vehicle on a screen. The C63 Sedan only offers a rear monitor and front and rear parking sensors that beep or flash a light. That doesn’t help with obstacles to the sides. Both the M5 and the C63 Sedan have standard driver and passenger frontal airbags, front side-impact airbags, side-impact head airbags, front seatbelt pretensioners, plastic fuel tanks, four-wheel antilock brakes, traction control, electronic stability systems to prevent skidding, available crash mitigating brakes, lane departure warning systems and blind spot warning systems. The BMW M5 weighs 419 to 531 pounds more than the Mercedes C63 Sedan. The NHTSA advises that heavier cars are much safer in collisions than their significantly lighter counterparts. The M5’s corrosion warranty is 8 years and unlimited miles longer than the C63 Sedan’s (12/unlimited vs. 4/50,000). BMW pays for scheduled maintenance on the M5 for 4 years and 50,000 miles. BMW will pay for oil changes, lubrication and any other required maintenance. Mercedes doesn’t pay scheduled maintenance for the C63 Sedan. 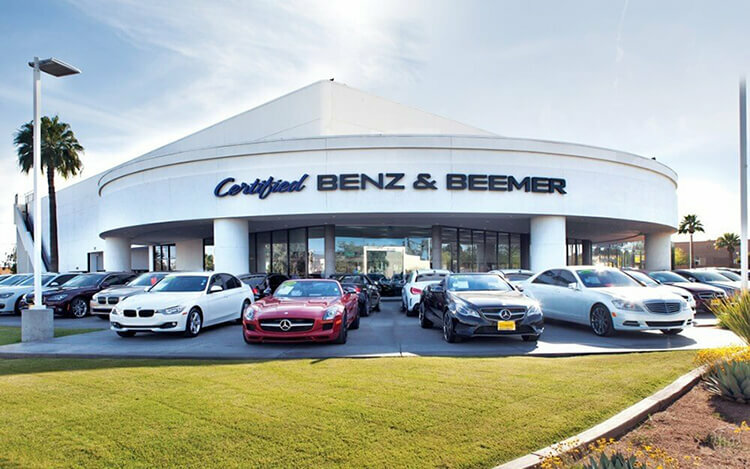 There are over 12 percent more BMW dealers than there are Mercedes dealers, which makes it easier should you ever need service under the M5’s warranty. J.D. Power and Associates’ 2015 Initial Quality Study of new car owners surveyed provide the statistics that show that BMW vehicles are better in initial quality than Mercedes vehicles. J.D. Power ranks BMW 6th in initial quality, above the industry average. With 12 more problems per 100 vehicles, Mercedes is ranked 14th. The M5’s standard 4.4 turbo V8 produces 91 more horsepower (560 vs. 469) and 21 lbs.-ft. more torque (500 vs. 479) than the C63 Sedan’s standard 4.0 turbo V8. The M5’s 4.4 turbo V8 produces 57 more horsepower (560 vs. 503) than the C63 S’ standard 4.0 turbo V8. The M5’s optional 4.4 turbo V8 produces 72 more horsepower (575 vs. 503) than the C63 S’ standard 4.0 turbo V8. Regenerative brakes improve the M5’s fuel efficiency by converting inertia back into energy instead of wasting it. The C63 Sedan doesn’t offer a regenerative braking system. The M5 has 3.7 gallons more fuel capacity than the C63 Sedan (21.1 vs. 17.4 gallons), for longer range between fill-ups. For better traction, the M5 has larger tires than the C63 Sedan (F:265/40R19 & R:295/35R19 vs. F:245/40R18 & R:265/35R18). The M5’s optional 295/30R20 rear tires provide better handling because they have a lower 30 series profile (height to width ratio) that provides a stiffer sidewall than the C63 Sedan’s optional 35 series tires. For better ride, handling and brake cooling the M5 has standard 19-inch wheels. Smaller 18-inch wheels are standard on the C63 Sedan. The M5’s optional 20-inch wheels are larger than the 19-inch wheels optional on the C63 Sedan. For a smoother ride and more stable handling, the M5’s wheelbase is 4.9 inches longer than on the C63 Sedan (116.7 inches vs. 111.8 inches). For better handling and stability, the track (width between the wheels) on the M5 is .8 inches wider in the front and 1.4 inches wider in the rear than on the C63 Sedan. The M5’s front to rear weight distribution is more even (52.3% to 47.7%) than the C63 Sedan’s (54.3% to 45.7%). This gives the M5 more stable handling and braking. The M5 has 3.4 inches more front headroom, 3 inches more front shoulder room, 1.2 inches more rear headroom, .9 inches more rear legroom and 1.2 inches more rear shoulder room than the C63 Sedan. The M5 has a much larger trunk than the C63 Sedan (14 vs. 12.6 cubic feet). Heated windshield washer nozzles are standard on the M5 to prevent washer fluid and nozzles from freezing and help continue to keep the windshield clear in sub-freezing temperatures. The C63 Sedan doesn’t offer heated windshield washer nozzles. Both the M5 and the C63 Sedan have standard heated front seats. The M5 also offers optional heated rear seats to keep those passengers extremely comfortable in the winter. Heated rear seats aren’t available in the C63 Sedan. Optional air conditioned seats in the M5 keep the driver and front passenger comfortable and take the sting out of hot seats in Summer. The C63 Sedan doesn’t offer air conditioned seats. On extremely cold Winter days, the M5’s optional heated steering wheel provides comfort, allowing the driver to steer safely and comfortably before the car heater warms up. The C63 Sedan doesn’t offer a heated steering wheel.